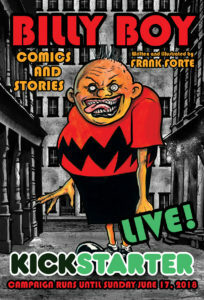 Billy Boy Comics and Cartoons is a collection of dark and disturbing tales of a delusional kid who sees visions and monsters. Done in a style of classic cartoons from the Fleischer and Warner Brothers studios, Billy Boy is rendered in a very cinematic and ‘rubber hose-like’ style. These issues include: “Slingshot Madness,” has Billy get into some trouble when he and Teddy shoot up Old Mrs. Pine’s house with their brand new wrist rocket. In “Swamp Jitters,” Billy is on the run from a giant spindly insect. Also, in “Bad Charm Bill,” our pudgy star gets caught up in the black arts… and it doesn’t end with a smile!